Why in heaven's name did Brian Kennedy, the multi-millionaire double glazing magnate who out of the goodness of his bountiful heart poured his energies and money into helping to find Madeleine (e.g. by appointing Metodo 3 and Kevin Halligen to help find her), take his lawyer, Freemason Edward Smethurst, to meet with the leading suspect in the case, Robert Murat, who was suspected of abducting or killing Madeleine. And why was Robert Murat's lawyer there? Were they all on a mission to find Madeleine? Or were they and their lawyers sorting out something very different and striking up some sort of deal, or even a contract? Some of the answers maybe in Chapter N of our 120-page article on Robert Murat [ www.madeleinefoundation.org.uk/Articles/ ]. We’ll now move right away from the events of early May 2007 and look at two meetings that were probably of great significance in this case that took place in Portugal in November 2007. One was between Robert Murat and Brian Kennedy, the multi-millionaire double glazing magnate who has effectively bankrolled the various private investigations which were supposed to be about finding Madeleine. Others were also present at this meeting. 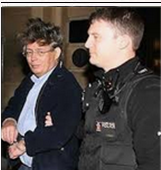 He was also, as was made clear in John Whitehouse’s article on our website, the man who was at the centre of these intelligence operations, running them from a house believed to be in Knutsford, appointing the staff and directing them. The other meeting was between Brian Kennedy, the Portuguese Police, and the Spanish private detective agency recently chosen by Kennedy and the McCanns: Metodo 3. This took place in police headquarters in Portimao. “On the 19th of October, we were contacted by Alberto Carbas, Chief of the Kidnapping Unit of the Commissary-General, based in Madrid, who passed to us the information that the McCann family had contracted a Spanish private detective agency known as ‘Metodo 3’. The costs of their investigation into Madeleine McCann were being covered by a Scottish multi-millionaire whose name is Brian Kennedy. His objective was to find Madeleine. “We were asked if we were available and interested in meeting with a representative of Metodo 3 and the Spanish Commissary General and Chief of the Kidnapping Unit of the Police in Spain. The purpose of this proposed meeting, they said, was to find out the truth, but they stated that they would not interfere in police work. At most, they said, they would ‘complement’ our investigation. They firmly stated that they are not working directly for the McCann family, but for Brian Kennedy. They didn’t ask for any information regarding the investigation, nor was any offered to them, for obvious reasons”. “We held a meeting on 13 November, with Inspectors Paulo Ferreira and Ricardo Paiva present, with Brian Kennedy, Director of the detective agency, Francisco Marco and one of his advisers, plus Antonio Jimenez, ex-chief of the Kidnapping Unit of Catalonia [Note: Other information suggests that Edward Smethurst was also present]. Brian Kennedy insisted that his motives were purely charitable, aimed at finding the truth, and generally helping missing children. He said he was interested in discovering the truth even if the McCann family, the friends, or any other person is found to be involved in the disappearance”. The ‘Evening Standard’ article also showed that, later, the relationship between Metodo 3 and the Portuguese police had ‘completely broken down’. Hollingsworth claimed that key witnesses were questioned ‘far too aggressively’ by Kennedy’s investigators, so much so that ‘some of them later refused to talk to the police’. 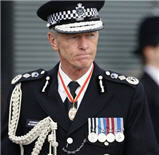 Interference with witnesses to that extent could amount to a criminal offence. We are not aware that any other nation allows people to interfere with potential witnesses in an investigation in such a way as to cause them to refuse to testify, as Mark Hollingsworth in his article claimed had happened in this case, due to Kennedy’s investigators. It was Francisco Pagarete, Mr Murat’s Portuguese lawyer - the one whom he was so anxious to see when he flew out to Praia da Luz on 1 May - who confirmed that a second meeting involving Brian Kennedy took place at Mr Murat’s uncle’s house in the Algarve in November. He told the BBC: “[Brian Kennedy] came here to give his support to Robert and to say he doesn’t believe Robert was involved in this story in any way or sense. And he asked if Robert could help the investigation for the finding of Madeleine in any way”. Mr Pagarete added that Mr Kennedy had ‘promised to stay in touch with Mr Murat’ but ‘had not contacted him since’. Mr Pagarete also confirmed that Edward Smethurst was at the meeting. The Portuguese paper Jornal de Notícias appeared to have some additional information about this meeting. Their report, early in 2008, said: “The meeting - a dinner that Brian Kennedy asked to be discreet and far away from the eyes of the press - took place in the end of last year at a house of Murat's relatives in Burgau (Vila do Bispo). At the dinner were Robert Murat and Kennedy, their respective lawyers, Jennifer Murat and the aunt and uncle of Murat” [NOTE: This appears in fact to have been Ralph Eveleigh, Murat’s uncle, and Sally Eveleigh, his cousin]. If Murat and Kennedy each had one lawyer with them - Pagarete and Smethurst - that makes seven people present at that dinner in Burgau: Murat and his mother, his uncle Ralph and cousin Sally Eveleigh, who ran the 8-room guest house at Vila do Bispo, two lawyers and Brian Kennedy. What was discussed at this meeting that Kennedy didn’t want the press to know about? This evening meeting was either on the same day, or very close to, the meeting that Brian Kennedy had with the Portuguese Police on 13 November 2007 that we referred to above. The two Portuguese Police Inspectors, Ferreira and Paiva, later submitted an account of their strange meeting with Brian Kennedy. The report, which is amongst the documents contained in the police files, indicates that right at the start of the meeting, Brian Kennedy was keen to stress that his intentions were ‘purely charitable’, because he felt ‘concerned about cases of child neglect and child abduction’. The Director of Metodo 3, Francisco Marco, presented information to the PJ about three situations, allegedly received via their ‘hotline’. 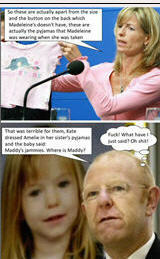 The first of these concerned an incident that the British media had already referred to, at the end of October 2007: a woman who had been baby-sitting at the Ocean Club, in Apartment 5A in August/September 2006, said she spotted a man ‘hidden in the shadows’, the same day that Madeleine disappeared. A story about this had surfaced in the Sun on October 31. According to the newspaper, “The nanny - identified only as M.H. 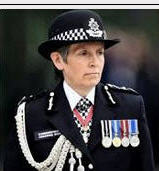 - reported the frightening incident to the police in England after the hunt for Madeleine started in May, but did not speak to the police in Portugal”. Clarence Mitchell added that: “This evidence supports what we have always said, that Maddie was taken from her bed by an abductor”. The Portuguese Police had however ruled out this report, because the detectives considered that there was no proof that it was in any way related to Madeleine's disappearance. The second piece of information was about the alleged existence of images of paedophilia on a computer at the home of Sergei Malinka, witnessed by the fiancé of a British woman, four years ago, when he was at Malinka's house. According to this witness, he questioned Malinka on the subject and he explained that the computer belonged to a client and that he would report it later to the authorities. All of the computers at Malinka's house were seized and examined, but the Portuguese Police report said that nothing of any relevance or suspicion was found. The third piece of information referred to a detailed witness statement, according to the Metodo 3 report, about a woman handing what the witness was convinced was a child, wrapped in a blanket or a sheet, over a fence to a man, next to two parked vehicles, near a town 100 miles from the Algarve. The witness, a Portuguese lorry driver, M.G., looked at several photos and picked out Michaela Walczuk [Robert Murat’s girlfriend, now his wife], saying that her picture was the one that most resembled the woman he had seen. The British media published a version of this story on 19 November 2007, but with different details. The METRO free paper boldly wrote: “A witness spotted Murat's German girlfriend, Michaela Walczuch, in a car with Maddie, on 5 May, in central Portugal”. On the same day, the Daily Mail published a similar story: “According to a source, a new witness identified Michaela Walczuch as the woman seen with the missing child, in central Portugal, 160 kilometres [100 miles] from where she disappeared on May 3rd”. As usual, Clarence Mitchell had a few things to say to the media: “We are not going to comment on any line of the investigation except to say that we are encouraged by the fact that our investigators seem to be making progress. 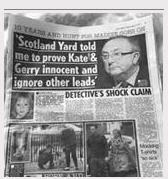 Kate and Gerry are not ruling out any possibility”. The Portuguese Police studied this incident and questioned the Portuguese lorry driver, but the facts that he described to the police were somewhat different to those reported in the British press. The lorry driver said he saw a woman handing something to a man, over a fence, wrapped in what looked like a blanket. It wasn't heavy, because they did it easily and the fence was around 1.6 metres high (5 feet). Asked if it could have been the body of a child, he responded that nothing he had seen would indicate that. Questioned also about the positive identification of Michaela Walczuk, according to Metodo 3's report, the witness told the Portuguese Police that he couldn't see the woman's face, because he was driving his lorry at 45/50 mph, and the couple were at some distance. He only chose Michaela's photo from amongst the others Metodo 3 had shown him because she had the same hair colour and similar build. The actual facts which emerged from the lorry driver, then, did not seem anywhere near sufficient to justify the press headlines claiming that he had positively identified Murat and his girlfriend.